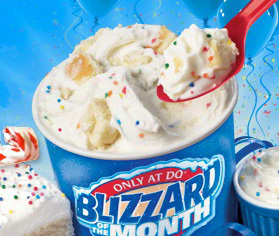 There's nothing cooler than hitting DQ on the first of the month to find out what the new blizzard is. Sure, there's the occasional disappointment if you DQ isnt ready for it yet, but if you have a well prepared store nearby, it's like Christmas... ok, too far, but there is definitely a fun factor when that blizzard isn't just new for the month, but totally new to Dairy Queen. 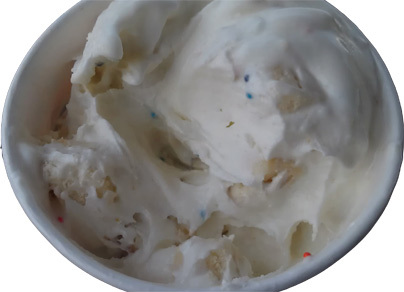 It's moist white cake pieces and confetti frosting blended with creamy vanilla softserve. Actually, the really bad news is that I can't save those of you who have already tried it. Here's mine and there aren't a ton of fun confetti pieces about. Thankfully that's a good thing because on occasion you get a rock hard confetti piece. Here's a much better look. Hopefully you can see all the uncovered cake pieces. I think I got a minimum of two in every bite. Now let me be clear that this blizzard is not all that bad. They use a nice vanilla frosting that really pops through, and the crazy amount of cake bits really ties it all together. My blizzard was actually quite tasty and for the most part I was enjoying it. I was really digging the icy cold frosting vibe. So what's the problem? Well for starters my wife got too much frosting in hers. She kept complaining and I was going "it's not that bad". Well I had a few bites of hers when she was done and she definitely got too much frosting. The frustrating part was that I had switched with her because the blizzard I took was a bit more photogenic. I know the two should have matched, but they didn't. She wound up eating about 65% of hers. "Your daughter loved it right?" Well, surprisingly no. I'm not 100% sure what her problem was, but first she was asking why I didn't get her a kids size, and then she went staight to being sad I didn't get her usual Oreo blizzard. She tried to stay upbeat but I don't think she even made it half way through her small. She never specifically said she didn't like it, but it was pretty obvious she didn't -- I asked my daughter later and she said two things: 1) Too Sweet 2) Too much cake. I can't believe I impatiently waited 26 days for this only for it not to be a huge hit. I was sure my daughter would love this one, and I was hoping it would win my wife over too. Even I had some trouble with it. I was enjoying it for the most part, I really thought I was, but despite the fact I was hungry as could be, I only ate about 3/4 of mine and gave up. It was like "I'm good, why bother eating any more". I tossed my blizzard in with my wife's with the thought that it would stay colder and maybe I could finish it when I got home. Well, none of us went back for more, but it proved for an interesting experiment. For whatever reason, all the cake bits floated to the top. I've never notice this before, but I've never looked for it either. I don't know what they did to these cake bits, they taste fine and have a good solid flavor and texture, but even after 45 minutes, they were still solid and dry inside (I was still exerting effort to cut them in two). The picture you see above is actually from 2 hours after we bought the blizzard. Look closely at the bottom of the picture and you will see one that I had freshly cut in half. It still looks like cake! 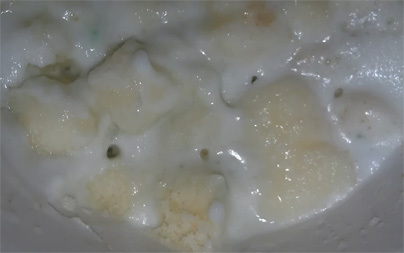 I expected total mush and we've still got a solid chunk. That's too funny, too too funny. I am dying to try that Blizzard - cake batter is my favorite flavor. Too bad that it was a let down though :( Too much frosting can be an overkill. That Triple Chocoholic Blizzard they had a while back was the high-water mark. When is that thing coming back? There's a bunch I haven't even bothered to try since that one. at least it seemed to be a true frosting flavor and not just a sugar high. I'm all for that one coming back! maybe later in the summer. I love the confetti cake blizzard. It's my favorite blizzard of all time, and now nothing really compares for me. 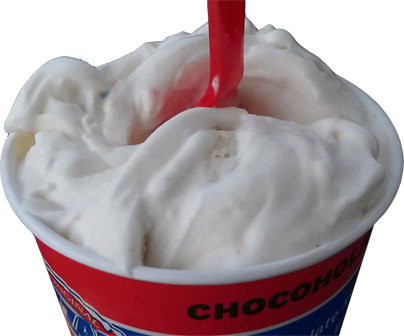 Though the last time I ordered it, the DQ I went to was incredibly busy, and it seems some of a Reese's peanut butter cup blizzard got mixed in, so I'd randomly get peanut-tasting bites, which ruined the whole thing. I loved this thing. I waited a whole year in hopes they would bring it back the same month as last. They didnt and I was heartbroken :( Even wrote them an email asking them to bring it back and they said theyll put it in a pile and if there is enough demand theyll consider bringing it back. Dream crushers. I couldn't be saved. Was not that good. I think for whatever reason DQ is pushing the Waffle Cone Blizzard thing, and they needed a spring'ish flavor that looked good in the photos. The white with colorful nonpareils certainly fits the bill. I wonder if it's a response to Wendy's Frosty Waffle Cones. suggestion Dairy Queen needs to cater to diabetics to not just sugar free dilly bars because there is a lot of different ages of diabetics out there anymore we like treats to. yes you have light smoothies but there packed with sugar to. JOsh, they actually started promoting last year I believe right before the whole Wendy's launch. Now that the weather is getting better, I believe that's their reason for promoting the ability to get a blizzard in a waffle cone again.